Abstract: The current paper describes a novel circularly polarized antenna meant to be employed on board of small unmanned aerial vehicles (UAVs). The antenna has the advantage of having a nearly isotropic radiation pattern as well as exhibiting a simple structure that is easy to manufacture and maintain. Further, the proposed design is lightweight and has inherent low air drag, which is beneficial when used on very small drones or fast flying aircraft. A simulation of the proposed antenna has been carried out using 4NEC2 free simulation antenna software. Through these means, the radiation pattern, gain, bandwidth and other parameters of the antenna were calculated. The authors were drawn to the idea of developing a novel antenna design for small unmanned aerial vehicles (UAVs) due to the need for experimental work on drone designs, instrumentation testing and autopilot innovations. The target radio band is 2.4 GHz, a common frequency band used extensively in the drone arena for control of the UAV as well as for telemetry and video signal transmission. Circular polarization has a number of benefits, most significant of which is the odd reflections attenuation (Gao et al., 2014). The base station may use two circularly polarized antennas with opposite polarizations in order to capture not only the direct wave, but also the first reflection. These two antennas would work in a diversity scheme. Another benefit of employing circularly polarized antennas with UAVs is the lesser dependence of the signal distortion on aircraft attitude. Although 2.4 GHz yields a small wavelength and hence small antennas in size, when applied to small drones the antenna still has significant dimensions and may hardly be incorporated inside the fuselage. Certain existing models do satisfy some of these prerequisites but not all – for further information see the next section. 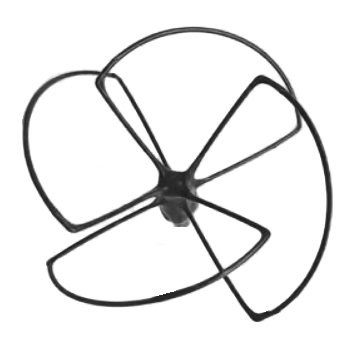 When it comes to circularly polarized antennas for drones one of the first choices is the Skew-Planar wheel antenna (Fig. 1). The Skew-Planar Wheel antenna was presented for the first time in the QST magazine in November 1963 (Mellen and Milner, 1963). It was further described in the ARRL Antenna Book from 1964. The antenna has four identical elements, resembling plant leaves. The elements are curved and hence are hard to manufacture. The Skew-Planar Wheel antenna is based on the Cloverleaf antenna invented by Phillip H. Smith (Smith, 1947). That’s why the variations of the Skew-Planar Wheel antenna are colloquially called Cloverleaf antennas. These variations differ from one another mainly in the number of elements and the most wide spread one of those is the three-leaved Cloverleaf antenna (Prakoso et al., 2017). Another prominent circularly polarized antenna is the turnstile antenna. It was patented in 1937 by George H. Brown (Brown, 1937). This design is clearly unsuitable for small drones as its construction rigidity is inferior to the cloverleaf antenna family (Fig. 2). There are a number of other circularly polarized antenna designs (Yang et al., 2014; Kan and Waterhouse, 2001; Kim et al., 2007; Huang, 2001) but being based on printed circuit board technology are unsuitable for the applications in drones due to their significant weight and pronounced aerodynamic drag. The current design borrows the idea from the Skew-Planar Wheel antenna, but alters the construction of the antenna elements to encompass only straight wire segments instead of curved ones. The unbent wire segments are easier to manufacture and maintain. This compromise is appropriate for short wavelengths that are inherent to the 2.4 GHz band and above where the added weight is insignificant. A general view of the antenna design can be observed in Fig 3. The antenna dimensions may be examined in Fig. 4. 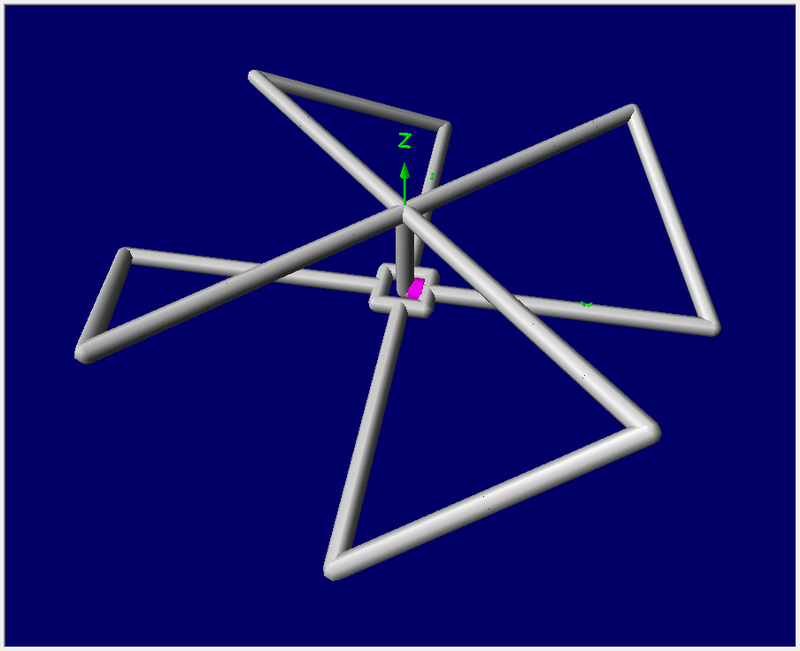 It is an interactive figure where the reader may calculate the antenna elements dimensions according to the chosen centre frequency. 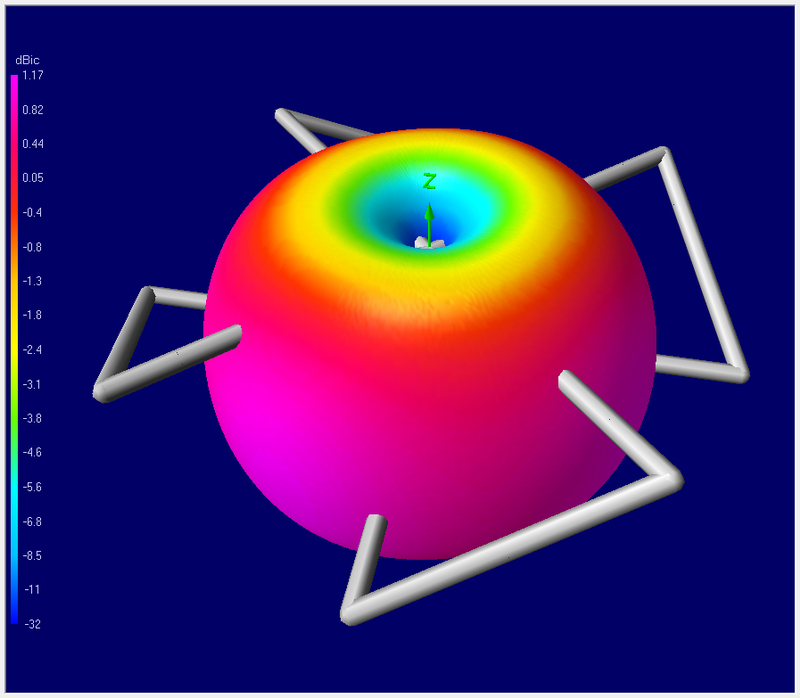 The proposed antenna design was simulated using the free 4NEC2 software. In Fig. 5 authors are displaying an interactive figure that can be used to generate a NEC file for feeding the 4NEC2 software. The figure requires the reader to input certain antenna parameters in order to generate the NEC file. For this simulation a centre frequency of 2440 MHz was chosen. 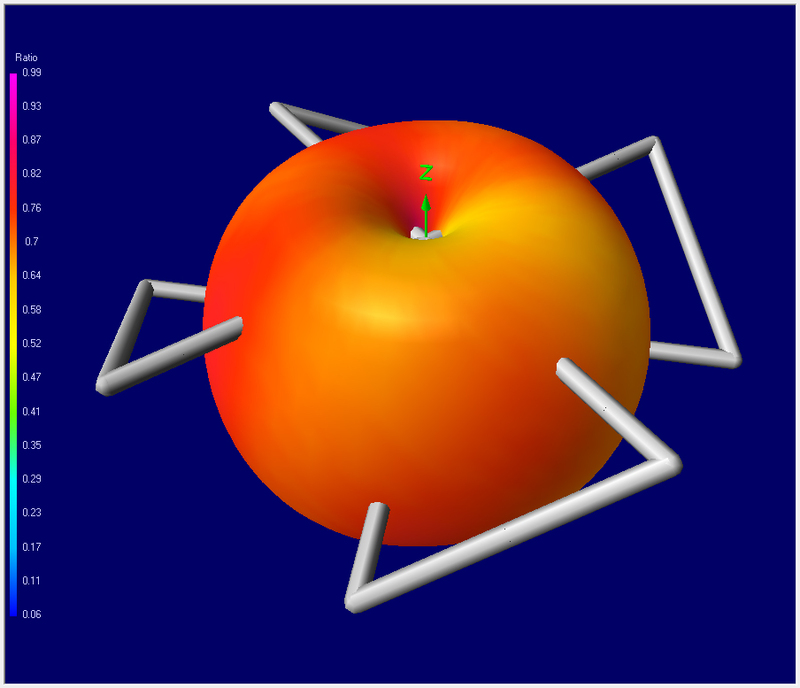 After performing the simulation we observed the following radiation pattern exhibited from the Total Gain 3D visualization (Fig. 6). Because the antenna radiation pattern is axially symmetric, an equally informative figure of the gain may be produced using a 2D chart in the vertical plane shown in Fig. 7. Here the right-handed and left-handed circular polarization gains are depicted using blue and red curves respectively. The antenna is right-handedly polarized and the left-handed polarization is a parasitic one. Antenna gain has dips along the vertical axis, which destroy its perfect omnidirectional radiation pattern, but these dips are narrow and by mounting the antenna vertical axis to be coincident with the vertical axis of the fuselage of the aircraft, the dips will affect the overall antenna performance marginally. 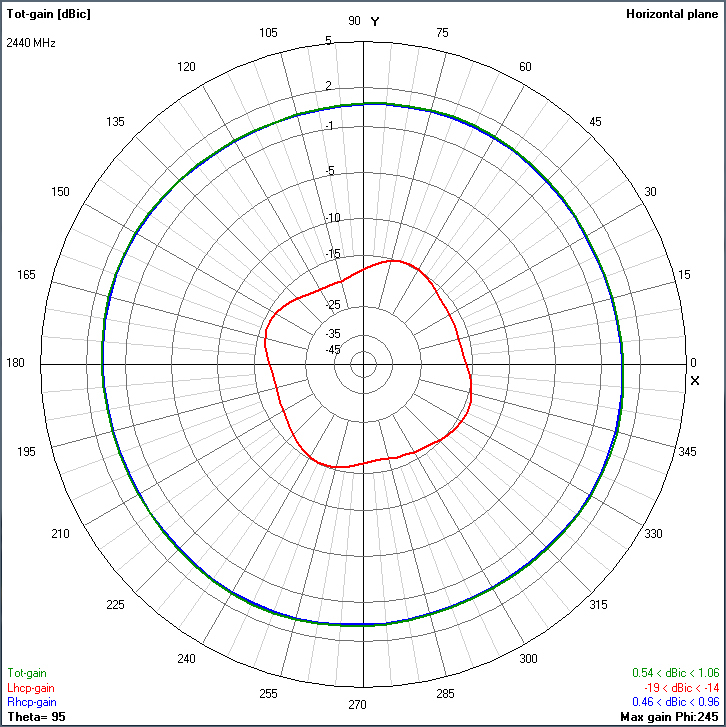 The same 2D plane chart of the antenna gain, but this time in the horizontal plain, is shown in Fig. 8. Here one could identify clearly the difference between the right-handed circular polarization gain and the left-handed one. Fig. 9 reveals the same information but in 3D view. 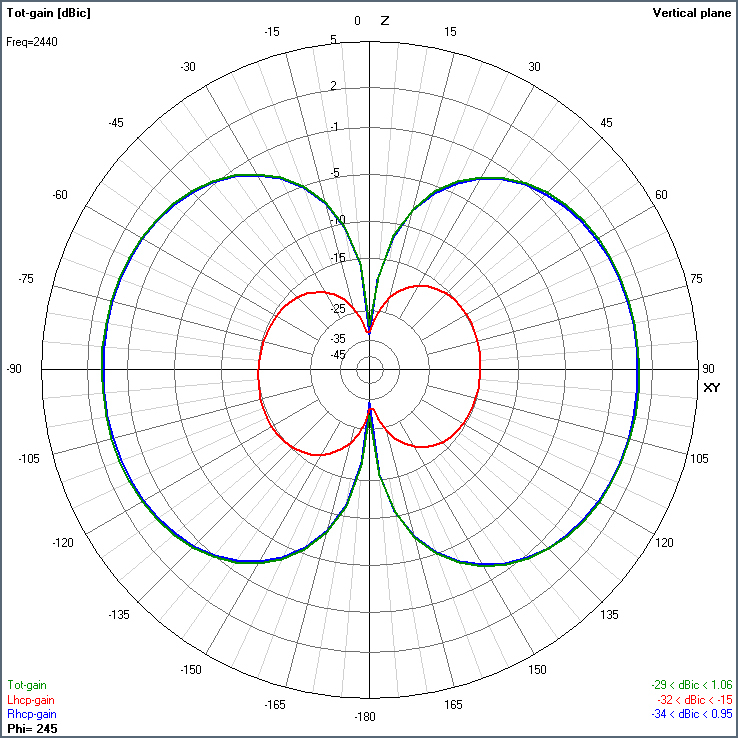 Another parameter describing the quality of the antenna is its axial ratio of the circular polarization (Fig. 10). It is defined as the ratio between the minor and major axis of the polarization ellipse. If the ellipse has equal minor and major axes it transforms into a circle, and the antenna would be perfectly circularly polarized – the axial ratio would be equal to unity (0 dB). When it comes to impedance, the antenna was designed to be fed with a 50 ohm feed line. (Fig. 11). The antenna impedance versus frequency was calculated as an active and a reactive component (Fig. 11 above). Also, the impedance as modulus and phase was shown in Fig. 11 below. 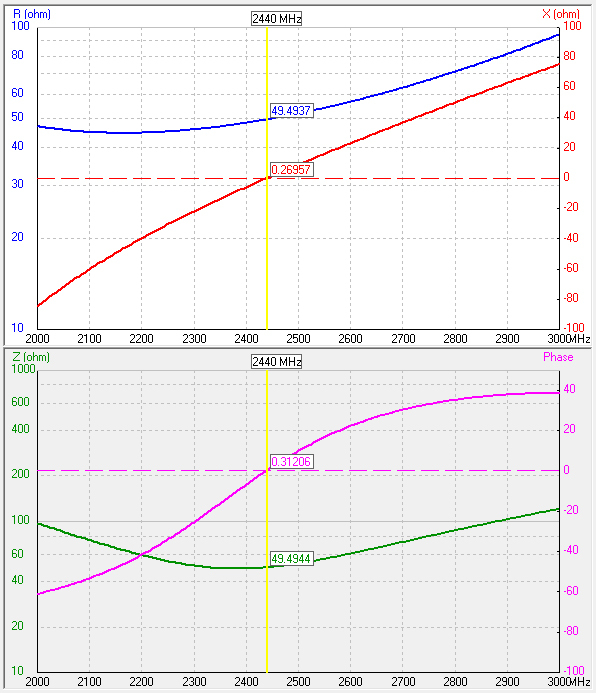 A good match of 49.49 Ohms is observed at the centre frequency. The reactive component is below 0.3 Ohms or put another way, the phase at the centre frequency is below 0.32 degrees. Figure 11. 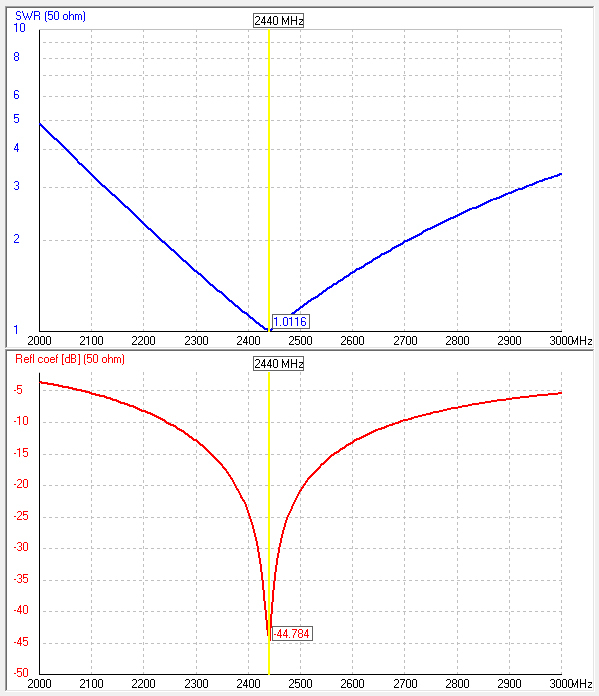 Antenna impedance versus frequency. Impedance was calculated in active and reactive components (above). Yet, the total impedance as modulus and phase is shown (below). The same data, but interpreted as the feedline matching behaviour is demonstrated in Fig. 12 where the standing wave ratio (SWR) and the reflection coefficient are depicted. The SWR is extremely good being only 1.01. Considering an acceptable SWR of 2.0 yields antenna bandwidth from 2250 MHz to 2700 MHz, totally overlapping the bands of interest. For example, the Wi-Fi IEEE 802.11 standard uses the frequency band 2400 – 2495 MHz. The analogue frequency modulation video systems on 2.4 GHz occupy the frequency range 2370 – 2510 MHz. For both applications the antenna offers maximum SWR below 1.5, which translates to only 4% power loss. The proposed design satisfied the prerequisites establish in the Introduction section of this material, namely it is: easy to manufacture and maintain; guarantees close to omnidirectional radiation pattern with the major exception in the vicinity of the two dips along the vertical axis; the antenna is lightweight, and may be constructed of duraluminium wires; the device has low air drag, due to its wire-based construction. Huang, J. (2001). “Miniaturized uhf microstrip antenna for a mars mission,” in IEEE Antennas and Propagation Society International Symposium, vol. 4, pp. 486–489. Kan, H. and Waterhouse, R., “Small square dual spiral printed antennas,” in Electronics Letters, vol. 37, 2001, pp. 478–479. Mellen, R. H. and Milner, C. T. (1963). “The Skew-Planar Wheel Antenna”. QST, November 1963, page 11. Brown, G. H. (1937). Antenna System. United States Patent Office 2,086,976, Patented July 13, 1937. Smith, P. H. (1947). “"Cloverleaf" Antenna for F.M. Broadcasting”, PROCEEDINGS OF THE I.R.E.-Waves and Electrons Section, pp. 1556-1563, December 1947.